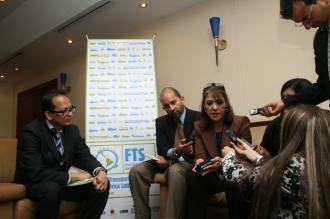 UNCRD-LAC supported the implementation of the Sustainable Transport Forum for Latin America FTS 2011, held from 22 to 24 June 2011 in the city of Bogot�, implemented in close collaboration with the UNCRD Environment Unit, the Inter American Development Bank, the Ministry of Transport and other organizations. The Forum aimed at promoting the integration of environmentally sustainable transport in general policies, planning and development processes in the countries of Latin America. A Bogot� Declaration was agreed among the participating countries, which delineated the common objectives of Environmentally Sustainable Transport in Latin America 2020. This initiative is a replica of a successfully implemented by UNCRD in cooperation with the Ministry of Environment of Japan and the Asian Development Bank for Asia. The Forum brought together Ministers of Transport from 12 countries in Latin America, and was implemented in collaboration with the Department of Economic and Social Affairs (DESA) of the United Nations Secretariat (based in New York), the Environmental Unit of UNCRD, Inter-American Development Bank IDB and the Ministry of Transport of Colombia, in support with other organizations. UNCRD-LAC Office concentrated its efforts on the website design and inputting of information, press/media issues, the Declaration, translations, management of the presentations and the sessions, moderation, and various logistical matters. Bogota Declaration was adopted by nine participating countries.